The more things change, the more they stay the same. Stray Dog Theatre presented John Guare’s disturbing play, “Six Degrees Of Separation” as their first production ten years ago. Returning to that source for the anniversary of the inception of their company, they show us why this story is still relevant today. Although “Six Degrees Of Kevin Bacon” has helped keep it in the public eye, it’s wonderful to revisit the original script and see why it’s still timely. Is there anyone to root for in this mix of comedy and tragedy? The Kittredge’s are full of themselves as they try to ooze a two million dollar loan from their wealthy friend in order to make a killing on a “sure fire” deal. Although set in 1990, a two million dollar investment is still a pretty stiff “borrow” from even the best of friends. As their plying their “mark,” Geoffrey with drinks and planning which hoity-toity restaurant to splurge their money on to bait and hook him, their plans are interrupted by a young, injured by a supposed mugging, black man, Paul who is let in by the doorman and, just as he has conned the doorman, he begins to con the Kittredges with stories of being in school (Harvard, of course) with their children. He is so charming as he is literally given the shirt off Flanders Kittredge’s back (his is bloody and torn), cooks them a fabulous meal (so they don’t have to spend a fortune at the local, overpriced eatery) and then regales them with tales from Harvard. It’s all believable to them and all, of course, a classic con- including his claim to being the son of Sidney Poitier (which they also fall for). Along with the running joke of all being cast in Poitier’s plans to make a of film of “Cats,” the whole thing is so implausible yet so irresistible that everyone is taken in. Through a series of reality checks, suddenly reprehensible behavior from Paul and confrontations with their children, the light suddenly dawns and then an unexpected turn of events at plays’ end makes this one of the most puzzling yet fascinating plays from the brilliant playwright, John Guare. The riveting cast makes it all work. Sarajane Alverson is perfectly gullible as Ouisa Kittredge. She is so anxious to keep climbing up the social ladder and remain a responsible and dedicated champion of worthy causes that she can’t help but latch onto Paul’s charismatic character. Gerry Love is perfect as Flanders, her wheeling and dealing husband who has some reservations but goes along with his wife’s charitable demeanor. Greg Fenner is simply outstanding as the con man, Paul. He weaves a story that even has the audience falling under his spell. And, like Ouisa, we almost fall into his trap a second time. Robert Ashton is delightful as the rich, South African philanthropist who agrees to Flanders’ plea for a loan, after a few drinks. 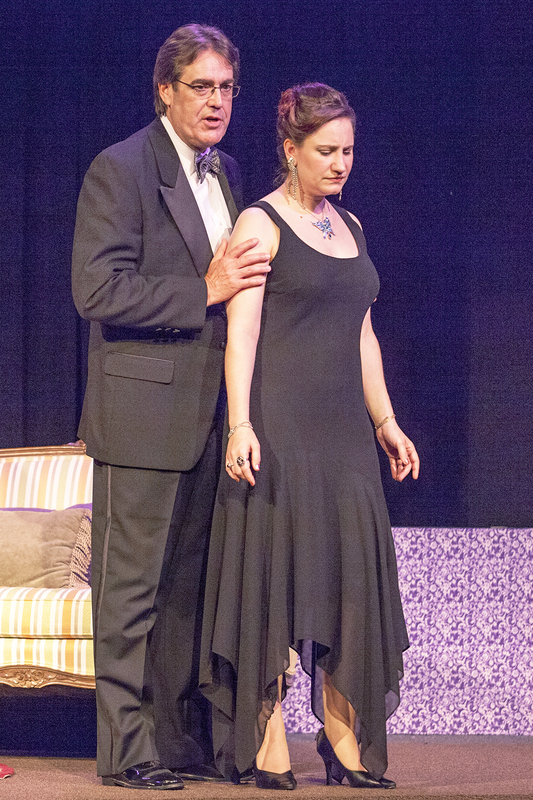 Kay Love and Christopher R. Brenner make a splash as the Kittredge’s friends while a supporting cast rounds out this long one-act of gullibility and greed. “Get rich quick” schemes are still with us in abundance today and, this lesson from the early 90’s, is still as relevant today as it was then. If it’s too good to be true, it probably is. Stray Dog Artistic Director, Gary F. Bell, returns to the helm to direct this production of “Six Degrees of Separation” just as he did ten years ago. It’s crisp and clean and right to the point. 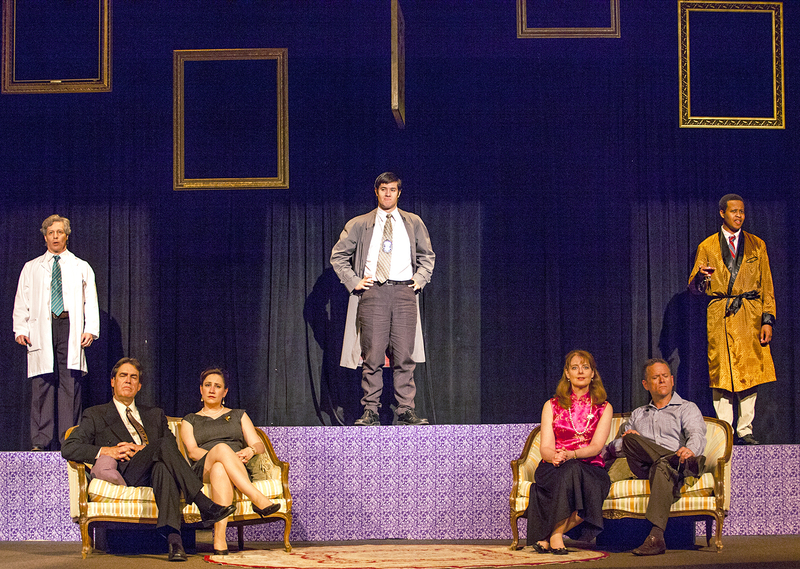 Justin Been’s set design is simple and effective while the Tyler Duenow lights add to the mix beautifully. You’ve probably played the trivia game more than you’ve seen a production of the play, but “Six Degrees of Separation” makes a welcome return to the St. Louis theatre scene. it’s nice to see an old friend every now and then and be reminded of how much we’ve missed him. So is the case with this delightful and almost forgotten play- solid and substantial as ever. Give Stray Dog Theatre a call at 314-865-1995 or visit online at straydogtheatre.org for tickets or more information. 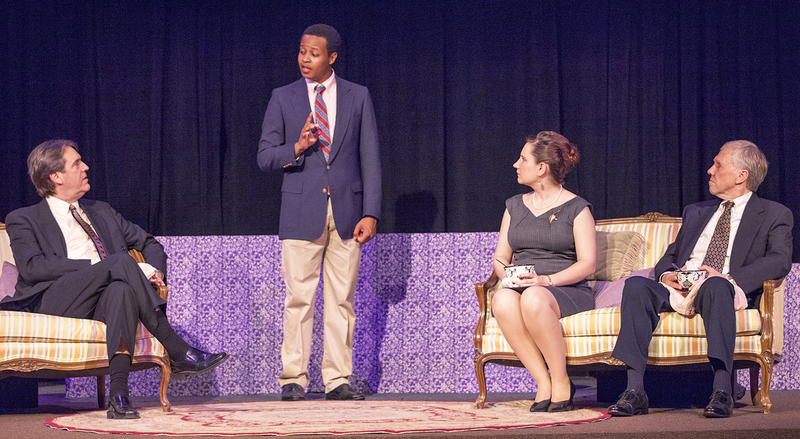 “Six Degrees Of Separation” plays through June 22nd.